A green roof testing plot using various plants with water storage units that are 70 millimetres deep. A testing plot with shallower water storage to use on structures that can’t bear as much weight. 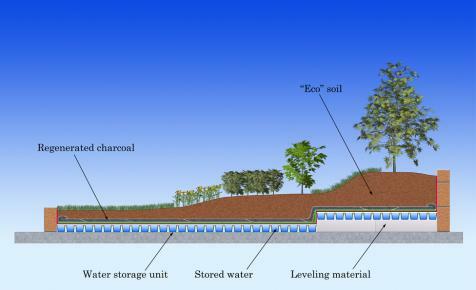 A schematic of Kawada's green roofing system. What the system does is slows down the process of water absorption and evaporation by capturing water in ice-cube-style trays below a surface of plants, soil and charcoal, according to Sean Johnstone, general manager of global business operators for Kawada Industries. The system, which Kawada calls Midori-chan, also includes a layer of resin netting that ensures soil and charcoal doesn’t fall into the water trays, and most importantly, keeps plant roots out so they won’t soak up all the water at once. Instead, the charcoal absorbs water vapor from an air space between the water and the resin layer, and then “feeds” it slowly to the roots, according to Kawada. A major building organization in Hong Kong is expected to use Kawada’s technology throughout the SAR, although the group has declined to comment on its plans at the moment. Kawada has performed tests for this organization for nearly two years, and has found more than 40 species of plants can grow relying on Hong Kong rainfall, and almost no additional water, Johnstone says. Over a 21-month period, and in three phases, Kawada did 58 different tests, using different soil design mixes, soil depths, water storage unit sizes, plant species and mulch types, he says. The mulch makes it more difficult for weeds to take hold. The system used 0.17 liters of water per square meter per month during the 21 months period. That compares with 189 liters of water per square meter per month consumed on a traditional green roofing system with the same plant species from July 2011 to April 2012, according to Kawada. The Midori-chan system used 0.35 liters per square meter per month in that shorter period. Kawada is now doing 30 additional tests on another more types of vegetation, including herbs, plants used in Chinese medicine, vegetables, and fruits, he says. They are trying to learn how much water the various kinds of plants need, how much weeding and pruning is required, and what soil depths are best, among other things, so companies or government offices that use the system have a wide range of plant choices, he says. Ideally, this system will expand beyond roofs to highway medians, planter boxes, and other places around the city that can use some greening up. As Johnstone notes, it would have the added environmental benefit of reducing the number of diesel-smoke-spewing watering trucks around town. The Hong Kong government knows the benefits of greening urban spaces as it has boosted the abundance of variety of plantings across the SAR through various stages of the “Greening Master Plan.” Hong Kong’s Civil Engineering and Development Department, which oversees the greening plan, also emphasizes the use of vegetation whenever it upgrades man-made slopes. The government can go a step further and look for a system of growing plants that uses as little water as possible.